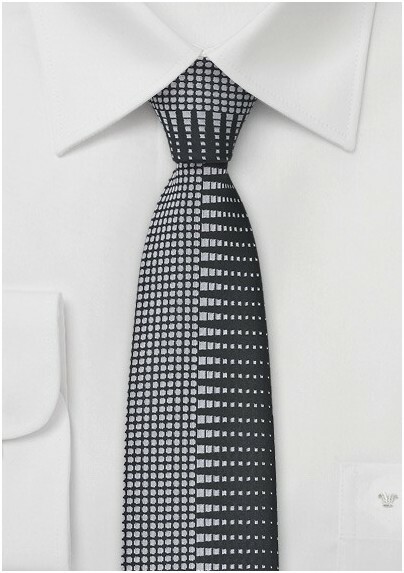 Lavish yourself in bold prints and urban color palettes this season, starting with this dynamically graphic patterned skinny tie in black and silver. The mesmerizing pattern packs an art deco inspired punch and has the power to instantly modernize anything it is paired with. Coordinate the coveted runway look by teaming this masculine tie with a microcheck dress shirt in light grey and a slim fit pewter gray suit. The black, silver and grey color combination will exude a cool and chic vibe. 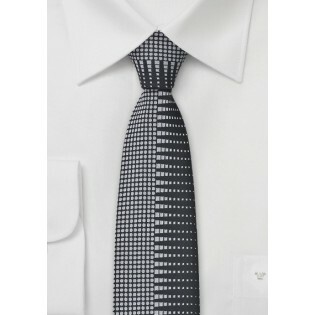 Designed by Puccini and made from a wrinkle resistant microfiber.